Expand your knowledge of Korean by learning irregularities, linking verbs, politeness levels, and much more with Level 3. Expand Your Knowledge of Korean by Learning Irregularities, Linking Verbs, Politeness Levels, and Much More! Welcome to Level 3! This book series (as with the majority of our learning material) is designed to help you learn Korean on your own in case you do not have the opportunity to attend classroom lessons. Study anywhere at any time with this book, and if you have any questions, please contact us and we will do our best to help you. These are very helpful in conjunction with a Korean class I take with a local Korean organization. It follows closely with our class textbook. Great job on assembling these! Across the board, TTMIK ships! 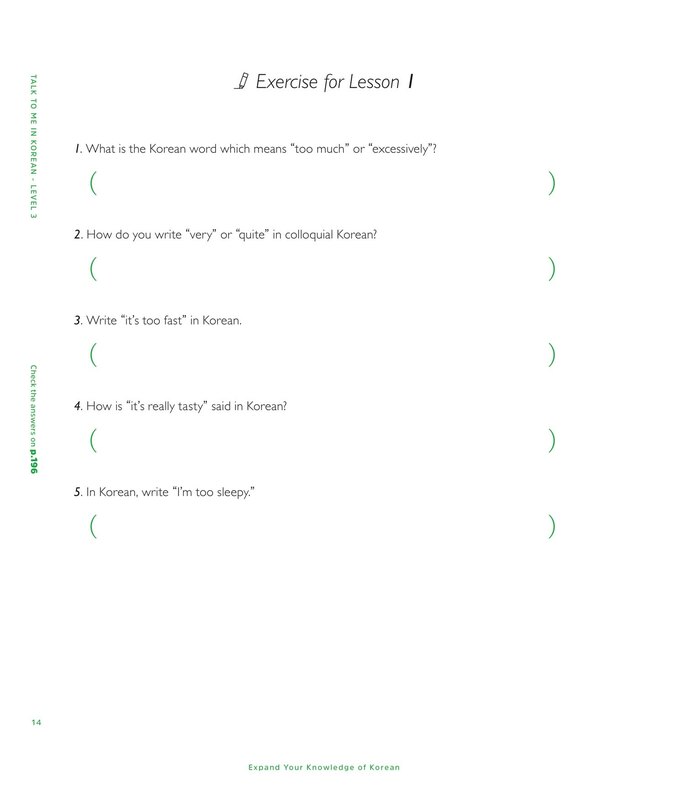 Awesome content in the Grammar Textbook Level 3, as is characteristic of TTMIK, so this time I'd like to mention the aesthetics of the TTMIK Grammar Textbooks. This is the third of my Grammar Textbooks that has traveled over 7,000 miles and arrived in absolutely perfect condition (signed by my teachers!). I really like the design. The folds of the front and back cover are very nice details that add to the sturdiness of the book and also mark my place. In addition to the excellent and entertaining style of the authors, the page layouts, fonts, and illustrations are visually pleasing, so after a long hard day at work, working in my Grammar Textbook is like a reward. Thank you to all at TTMIK!